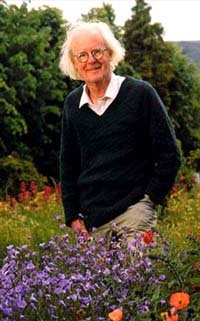 With great sadness, we pass on the news that John Maynard Smith died on the 19th of April 2004, peacefully at home. John was working at Sussex on original research up until a few days before his death. His contributions to evolutionary biology changed the field enormously, and he inspired many people to become biologists. We have lost a good friend, and we will miss him terribly. A farewell ceremony was held in Lewes on the 4th of May. A celebration of John's life and work took place at the University of Sussex on the 26th of June. A short biography from the online encyclopaedia, Wikipedia. A list of John's publications, from 1952 to 2003, can be downloaded as a PDF file. A foreword written by Richard Dawkins to the Canto reprint of John's The Theory of Evolution (Cambridge University Press 1993) gives a nice summary of John's character, and his great strengths as a biologist. This review of John Maynard Smith and David Harper's recent book Animal Signals will appear in the next edition of Science. Videos of John discussing his work on the origin of life and the mechanics of flight can be viewed online. In 2001, JMS was awarded the Kyoto Prize, Japan's highest private award for lifetime achievement. The citation for this prize, explaining John's contribution to the use of Game Theory in biology, is available here. He had earlier received the 1999 Crafoord Prize, awarded by the Swedish Academy of Sciences to scientists in fields not eligible for Nobel prizes. This prize, awarded jointly to JMS, Ernst Mayr and George C. Williams, was for "fundamental contributions to the conceptual development of evolutionary biology". JMS was also awarded The Linnean Medal by The Linnean Society in 1995, the Balzan Prize (Italy) in 1991, the Frink Medal by the Zoological Society (London) in 1990, and the Darwin Medal by the Royal Society in 1986. John endowed or inspired a number of prizes, including the John Maynard Smith Prize established by the European Society for Evolutionary Biology, awarded to outstanding young researchers in the field of evolutionary biology, and the John Maynard Smith Scholarship for postgraduate study at the University of Sussex. A recent interview from New Scientist magazine, published in 2003. A very wide ranging interview, covering many of JMS's topics of interest, from The Evolutionist, 1999. A video interview in which JMS talks about his life and work is available (following free registration) on the Peoples Archive. Five short videos of JMS discussing evolution. Photographs of JMS on Sean Nee's website. A tribute by Marek Kohn. Memories of John, hosted by American Naturalist. If you require more information about JMS, please contact Maggie Clune, +44 (0)1273 678209, or Jacqui Bealing, +44 (0)1273 877437, in the University of Sussex Press Office.